WARWICK, RHODE ISLAND, FEBRUARY 4, 2019: To increase the completion rate of critical college financial aid forms, particularly from high school seniors in historically underrepresented urban schools, the Rhode Island Student Loan Authority (RISLA) and its College Planning Center today launched a comprehensive grassroots campaign aimed at getting more financial aid to students interested in attending college. The broad-based campaign “It’s FAFSAszn” features real Rhode Island high school students in its social media ads and videos and utilizes texting as a means for them to receive help on RISLA’s web site; https://www.risla.com/fafsaszn. A key component of the campaign is the use of teens talking and texting with their peers to encourage completion of these important financial aid forms. “In addition to efforts by teachers, school counselors, and the College Planning Center communicating the importance of filling out the FAFSA, we have identified student interns in key high schools to help us have that conversation with their friends and peers, and use their own social media channels to talk about the array of tools at their disposal,” explained Stacy Crooks, Director of the RISLA College Planning Center. Social media high school student interns assembled from urban high schools throughout the State who will compete for prizes by signing up friends and peers. The Rhode Island Student Loan Authority (RISLA) is a non-profit quasi-state authority which has been providing affordable higher education solutions since 1981. It also operates the College Planning Center located at the Warwick Mall in Warwick and at 652 George Washington Hwy in Lincoln, Rhode Island. In addition to providing loans and facilitating applications for federal grants, RISLA educates families on how to obtain financial aid, walks students through the college planning process, provides tools that can help families make informed and responsible borrowing choices for college, and aids students in jump-starting their careers. WARWICK, RHODE ISLAND, JANUARY 16, 2019: The Rhode Island Student Loan Authority (RISLA) announced today that it has suspended repayment of college loans for federal employees currently not being paid, including military personnel, throughout the duration of the government shutdown. According to Charles Kelley, Executive Director of RISLA, the non-profit student loan organization is applying a forbearance on a month by month basis for as long as employees are furloughed and not receiving compensation. There are no fees associated with the request nor will there be any late fees assessed. “We certainly understand the hardship experienced by federal employees impacted by the government shutdown and since we can in some small way ease their financial burdens at this time, we will,” said Mr. Kelley. The Rhode Island Student Loan Authority (RISLA) is a non-profit quasi-state authority which has been providing affordable higher education solutions since 1981. It also operates the College Planning Center located at the Warwick Mall in Warwick, Rhode Island. In addition to providing loans and facilitating applications for federal grants, RISLA educates families on how to obtain financial aid, walks students through the college planning process, provides tools that can help families make informed and responsible borrowing choices for college, and aids students in jump-starting their careers. ATTENTION STUDENTS: The FAFSA is live! Be sure to fill it out! Providence, RI – Governor Gina Raimondo, the Office of the Postsecondary Commissioner, and the Rhode Island Student Loan Authority (RISLA) are encouraging Rhode Island high school students to complete the application for federal student aid, commonly known as the FAFSA, to ensure every student who qualifies for federal aid receives it. The FAFSA is the first step to applying for college financial aid. All schools use this application to award federal student aid, including the Pell Grant and low-cost student loans, and many use it to determine how much institutional aid a family is eligible for. Last year, Rhode Island had the eighth highest percentage of high school students in the country completing the form. This year, Governor Raimondo wants Rhode Island to be number one in the country, making sure every student who qualifies for aid receives it. October 1 marked the day the Free Application for Federal Student Aid, or the FAFSA, became available to families looking for college financial aid for the following academic year. The Office of the Postsecondary Commissioner is leading a collaborative effort with the Governor’s office, the Rhode Island Student Loan Authority, and the Rhode Island Department of Elementary and Secondary Education to drive up the state’s FAFSA completion rate this year, including outreach to more adult students, low-income students, and students of color to encourage them to file the form. Some students and parents find the FAFSA, which contains over 100 questions, to be complicated and confusing. This summer, a new mobile application, myStudentAid, was launched by the US Department of Education to help simplify the process of filing the FAFSA. The app, available on the Apple App Store and Google Play, customizes the experience of completing the FAFSA based on who is filling out the form. “We expect that this mobile app will assist many tech-savvy students and parents, but we recognize there are still many families out there who prefer to have hands-on assistance when completing the FAFSA. We have been assisting thousands of families with completing the FAFSA for twenty years, and our services are completely free,” said Stacy Crooks, Director of the RISLA College Planning Center, a quasi-state public authority that offers free assistance completing the FAFSA. To assist students and parents with filing the FAFSA, the RISLA College Planning Center will host nine free events during the 2018-19 academic year. Families who are unable to attend an event, or prefer to receive help in a more private setting, are encouraged to book a free one-on-one appointment in at the RISLA College Planning Center, located in Warwick and Lincoln, at www.collegeplanningcenter.org. Students and parents can also learn more about the importance of filing the FAFSA by texting keyword “FAFSA” to 24000. This fully mobile service will allow users to securely and privately access rate offerings and determine their eligibility for a loan with RISLA from their phone with minimal data entry. Once pre-qualified, borrowers can complete the online application, upload image captures of any documents needed for the application process, and electronically sign from their mobile device or continue the application process on their home computer. Other education loan providers can require the borrower to enter several pages of information before the student or family is even told what their interest rate will be. As a non-profit, full transparency is a priority to RISLA. “When we help families refinance their education loans, we are often shocked at the high interest rates that many borrowers are burdened with. We realized that we needed to do more to make low cost state-based programs like RISLA’s easier to access and remove barriers that typically prevent students and parents from getting the best deal for their individual situation.” said Lindie Thibodeau, Director of Marketing for RISLA. RISLA’s college loans are available to qualifying RI residents and to out-of-state families of students who are attending any of RI's outstanding institutions of higher education. Rhode Island Student Loan Authority (RISLA) is a non-profit state authority that has been helping families pay for college for over thirty-five years. RISLA gives back to the community with free college planning and financial aid counseling through the RISLA College Planning Center and through Bridge.jobs, a free internship finder that connects students with Rhode Island employers. For more information on RISLA or to apply for a loan, please visit risla.com. Warwick, RI – January 12, 2018…The RISLA College Planning Center is happy to announce that in addition to its two permanent locations in Warwick and Cumberland, Rhode Islanders will have access to free college planning services at local high schools throughout Rhode Island this winter. Throughout January and February, RISLA College Planning Center counselors will be traveling across the state in an effort to make filing the FAFSA and CSS Profile easier for college-bound families. The Free Application for Federal Student Aid, more commonly referred to as the FAFSA, is the first step to applying for college financial aid. All schools use this application to award federal student aid and many use it to determine how much institutional aid a family is eligible for. Many parents and students find this form, which contains over 100 questions, complicated and confusing. Families should be aware there are free services available to help them complete these forms. All of the College Planning Center’s services are provided free-of-charge by RISLA, a non-profit state authority. The College Planning Center has been providing expert in-person and web-based college planning guidance to students and parents since 1998. The CPCRI offers one-on-one college planning counseling, informational seminars, and online tools to promote college planning and financial aid awareness among Rhode Islanders. For more information, please visit www.collegeplanningcenter.org. If you are a resident of Texas or Louisiana, we recognize you and your family may have been seriously affected by Hurricane Harvey. During this difficult time, we want to do our part to help make life a little bit easier. To help ease any financial burden you and your family may be experiencing, we are automatically putting your RISLA non-federal loan accounts into a temporary deferment. This means you will have no payments due for three months after the hurricane affected your area. This deferment will not have any effect on the total amount of forbearance time for which you are eligible. However, interest will continue to accrue on your account during this deferment period. If you are able to pay during this time, please feel free to do so and we are happy to remove your account from this temporary deferment at your request. Please know that our thoughts are with you as your state recoveries from this terrible tragedy. If you have any questions at all, or need to further extend your deferment, please reach out to our customer service team toll-free at 1-888-897-4752 or via email at customerservice@risla.com. 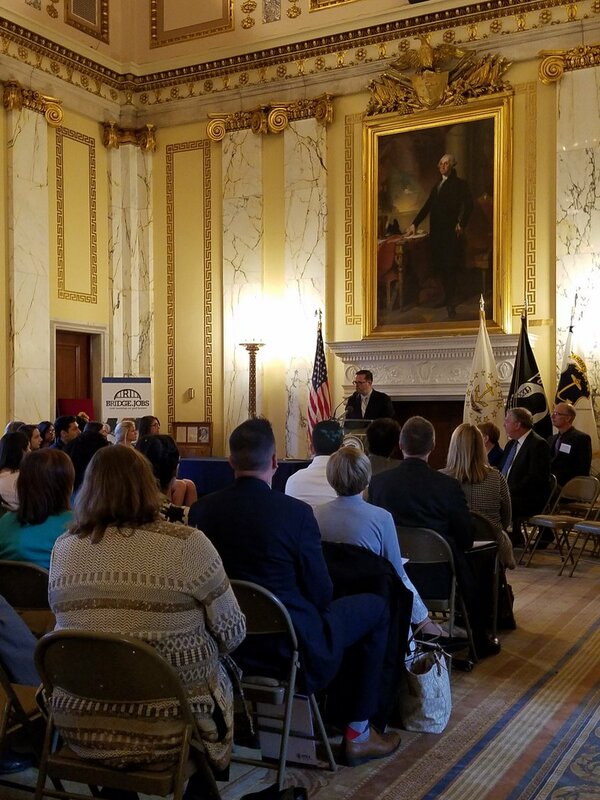 Providence, RI (May 1, 2017) – Employers and students gathered today at the State House in recognition of the important role that internships play in developing a skilled workforce, retaining the best talent in Rhode Island, and opening up opportunities for new college graduates. The event, the Bridge.jobs Internship Summit, commended employers for their exemplary internship programs, provided opportunities for students to learn strategies to increase their employability, and fostered connections between RI employers and college students through networking opportunities. The Bridge.jobs Internship Summit kicked off with an employer recognition ceremony. CVS Health, Social Enterprise Greenhouse, RISD Museum, IGT, BankNewport and FM Global were applauded for their exemplary internship programs. A recent survey run by the National Association of Colleges and Employers (NACE) showed that 72.7% of interns are offered full-time employment at the completion of their internship. In the same survey, employers indicated that converting interns into full-time employees is the primary goal of running internship programs. These results underscore the importance of internships in increasing employment opportunities and creating a more skilled workforce. At the event, students had the opportunity to network with RI employers during an internship fair and attend breakout sessions on creating a personal brand through social media, building relationships & networking, translating strengths to a resume, and diversity & cultural competency. 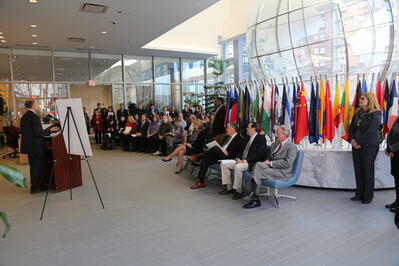 Meanwhile, employers attended a session on building and strengthening a successful internship program. The event wrapped up with a networking luncheon where employers and students had the opportunity to speak face-to-face. Bridge.jobs was launched in 2013 to encourage work-based learning for students, youth, and adult learners throughout Rhode Island. The objective of the program is to increase the work readiness, knowledge, and skills of the current and emerging workforce in the state, while giving students and adults greater opportunities to remain in RI and contribute to the state’s economic growth. Bridge.jobs is a partnership between RISLA, the Governor’s Workforce Board, the Association of Independent Colleges and Universities of RI, the Greater Providence Chamber of Commerce, and Rhode Island’s public colleges and universities. If you are unable to vie the video below, please visit WPRI. “Improving access to higher education, particularly by making it more affordable, is critical in keeping pace with improvements in technology and increased competition in the global workforce. Those efforts will take time, but RISLA isn’t waiting around for a massive overhaul, it’s addressing the symptoms head on, right now. As soon as I learned about the Student Loan Repayment Solutions tool that RISLA built, I was immediately able to see its value. I believe it will be able to help a lot of people ease the burden of student debt, and I’m eager to share it with our team at MojoTech.” - Jacob Brier, Operations Director at MojoTech. (February 1, 2016) - The Rhode Student Loan Authority (RISLA) is pleased to announce that it has extended the hours of its College Planning Center of Rhode Island (CPCRI) this month to help families complete their financial aid forms before the common March 1 deadline. The Free Application for Federal Student Aid, or FAFSA, must be completed in order for students to qualify for federal financial aid, including grants and scholarships. Some colleges also require the CSS PROFILE. The CPCRI is staffed by seasoned financial aid experts who can assist families with the completion process of both the FAFSA and CSS PROFILE forms and significantly cut down the amount of time it takes to file. Many colleges have a March 1 deadline for receiving financial aid applications so it's necessary for families to complete the FAFSA and other college financial aid applications in a timely manner so they don't miss out on available student aid. The CPCRI has three convenient locations and their services are provided at no cost. They are located at the Warwick Mall, at 576 Metacom Avenue in Bristol, and in Cumberland at the Boys & Girls Club of Cumberland-Lincoln. Appointments are required and can be made online at www.collegeplanningcenter.org or by phone at 401-736-3170. The College Planning Center of Rhode Island is a free service provided by the Rhode Island Student Loan Authority. December 14, 2015 - To view the full article, click here. December 13, 2015 - To view the full article, click here. Warwick, RI – The College Planning Center of Rhode Island (CPCRI), a free service run by the non-profit Rhode Island Student Loan Authority (RISLA), has teamed up with the Pawtucket Red Sox, B101 and Coast 93.3 to host a college fair on Wednesday, Sept. 16, 2015, from 6-8pm at McCoy Stadium. At the fair, students will have the opportunity to speak with college representatives from over 100 colleges and universities and get their questions about student life answered. All high school students - even students that aren’t sure if college is right for them - are encouraged to attend. A lot is at stake for students as studies have shown college graduates earn higher salaries and experience lower unemployment rates than those without a college degree. Choosing a college wisely can mean the difference between graduating and dropping out, so students need to do their research before sending in applications. Students should be open-minded as they start their college search and learn as much as possible about colleges so they make informed decisions about where to apply. It’s important for students to identify schools that are good matches both academically and financially, so students should be aware of the financial aid opportunities available to them and carefully compare school financial aid policies so they do not graduate with too much debt. Admission to the college fair is free and plenty of free parking is available. The event will take place indoors, rain or shine. The College Planning Center recommends students come prepared with a list of questions to ask the schools. WARWICK, RI (May 26, 2015) – The non-profit Rhode Island Student Loan Authority (RISLA) has announced that student loan interest rates on its fixed rate loans have been reduced to as low as 3.99%. In addition, all up-front fees have been eliminated for the 2015/16 academic year. “RISLA’s goal is to make higher education and training more accessible and affordable for Rhode Island families,” said RISLA Board Chairman Robert Delaney. RISLA’s safe, fixed interest rates start as low as 3.99% for the ten year repayment term with auto-debit. Families making the commitment to higher education can take advantage of these historically low interest rates to help students finance their education. RISLA also offers a “Parent-Only” loan where the student is not obligated on the loan. To put RISLA’s loan program in context, for the 2015/16 academic year the Federal PLUS loan for parents has a fixed rate of 6.84% and an upfront fee of 4.292%. Last year the average family in Rhode Island borrowed approximately $15,000, in addition to the student’s Stafford loan, meaning that family could save approximately $3,252 in interest and fees over a ten year repayment period by using RISLA’s 3.99% loan. RISLA loans also provide for loan forgiveness, up to $2,000, for qualifying internships and zero interest rate for up to four years for qualifying nurses who stay in the state after graduation. More information about RISLA’s loan programs can be found at www.risla.com. RISLA is a non-profit, self funding, quasi-state organization dedicated to student success. RISLA also operates the College Planning Centers of Rhode Island and the internship portal www.bridge.jobs in collaboration with the Association of Independent Colleges and Universities of RI, the Governor’s Workforce Board, The Providence Chamber of Commerce and the State Institutions of Higher Education. January 11, 2015 - The Rhode Student Loan Authority (RISLA) is pleased to announce that it is offering expanded winter hours at its College Planning Center of Rhode Island (CPCRI) to help more students and families complete their financial aid forms. The Free Application for Federal Student Aid or FAFSA is the form students must complete in order to be eligible for federal financial aid, including grants and scholarships, at educational institutions nationwide. The FAFSA is also the application used to determine eligibility for the Rhode Island State Grant. Most colleges have priority deadlines for awarding financial aid so it's imperative that students complete the FAFSA and college financial aid applications in a timely manner so they won't miss out on available student aid. The CPCRI is staffed by financial aid experts who can help students and families complete the forms and take away much of the stress associated with completing this long and complicated financial aid form. In addition to receiving assistance with the FAFSA, families can also get help filing the CSS Profile and other financial aid forms at the CPCRI. During the summer and fall, students and families may book a free session for college planning and admissions guidance. Warwick: Monday, Tuesday, Thursday 9-7; Wednesday & Friday 9-7:30; Saturday 12-7 and Sunday 12-6. Bristol: Monday, Thursday, Friday 9-4:30; Tuesday and Wednesday 9-7. Cumberland: Monday, Tuesday and Friday 9-4:30; Wednesday and Thursday 9-7. Appointments are highly recommended and can be made online or by phone at 401-736-3170. The College Planning Center of Rhode Island is a free service provided by the Rhode Island Student Loan Authority. PROVIDENCE, RI (January 9, 2014) – Recognizing the valuable role internships play in the preparation of the state’s workforce and its economic growth, the Rhode Island Student Loan Authority (“RISLA”), the Governor’s Workforce Board, the Association of Independent Colleges and Universities of RI, the Greater Providence Chamber of Commerce, Rhode Island’s public colleges and universities, and the RI Partnership Project together announced a targeted new campaign to promote internships to Rhode Island employers through its BRIDGE.JOBS initiative. The group was joined in the announcement of the employer campaign by Governor Lincoln Chafee at GTECH’s world headquarters in Providence. The BRIDGE.JOBS campaign was launched over a year ago to encourage work-based learning for students, youth, and adult learners throughout Rhode Island. The objective of the program is to increase the work readiness, knowledge, and skills of the current and emerging workforce in the state, while giving students and adults greater opportunities to remain in RI and contribute to the state’s economic growth. Through its free website, BRIDGE.JOBS matches qualified interns with internship opportunities throughout Rhode Island. Thursday’s announcement at GTECH underscores the commitment that many area employers have already made to the BRIDGE.JOBS program. Leo Perrone, Director of Global Talent Acquisition at GTECH, Alexis Devine, Youth Development Coordinator at Lifespan, Valerie Joseph, RN, Nurse Manager at Clinica Esperanza, and Laurie White, President of the Greater Providence Chamber of Commerce all spoke of the benefits of providing internship opportunities to high school and college students as well as adults. The growth of internship opportunities has also been a priority of Governor Chafee and the Governor’s Workforce Board along with the Rhode Island Foundation. RISLA recently received a $100,000 grant from the Foundation, as part of the Make It Happen RI campaign to promote the benefits of BRIDGE.JOBS to Rhode Island employers. BRIDGE.JOBS is a partnership of the Governor’s Workforce Board, the Association of Independent Colleges and Universities of RI, the Greater Providence Chamber of Commerce, Rhode Island’s public colleges and universities, and the RI Partnership Project. To learn more about RISLA’s Bridge Jobs initiative, please contact Adrian van Alphen at 401-468-1796, or visit www.bRIdge.Jobs. WARWICK, RI January 7, 2014 - The College Planning Center of Rhode Island (CPCRI) has expanded hours at its three Rhode Island locations to help students and parents meet college financial aid deadlines. Many students and parents find the financial aid process intimidating. The CPCRI, the state’s leading non-profit resource for college planning, helps remove barriers to higher education by providing much needed help in navigating the complex financial aid process. All services are provided free of charge. The financial aid experts at the CPCRI are available to provide free one-on-one help to families completing college financial aid forms such as the Free Application for Federal Student Aid (FAFSA) and the CSS/PROFILE. “Last academic year our College Planning Center helped nearly 13,000 students and so far this year we are up 15% from where we were at this time last year,” said Noel Simpson, Deputy Director of the Rhode Island Student Loan Authority (RISLA), the agency that sponsors the CPCRI. All services offered by the College Planning Center are free to Rhode Island residents. Along with helping complete financial aid forms, the CPCRI also provides academic, admission, financial literacy and college selection advice to students. The Center is managed by Stacy Crooks, a former college financial aid and admissions officer. Additional help is available online through the CPCRI’s Financial Aid 101 tutorial and students can sign up for free email reminders (Ed Alerts) containing important deadlines and financial aid tips at www.collegeplanningcenter.org. Parents and students are asked to call ahead for an appointment at 401-736-3170 or book an appointment online at www.collegeplanningcenter.org. Contact Alyssa Pascarella at 401-468-1741 or email apascarella@risla.com.